When a prescriptions printed on Secure Guard Prescription Pad Paper has been copied, the word "VOID" appears on the photocopy in background. Strip of RED Rx symbols in margin disappears briefly when rubbed. 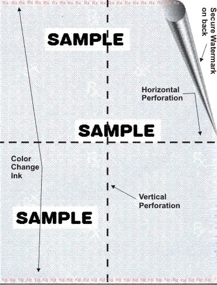 An artificial watermark is printed on the back of each sheet. 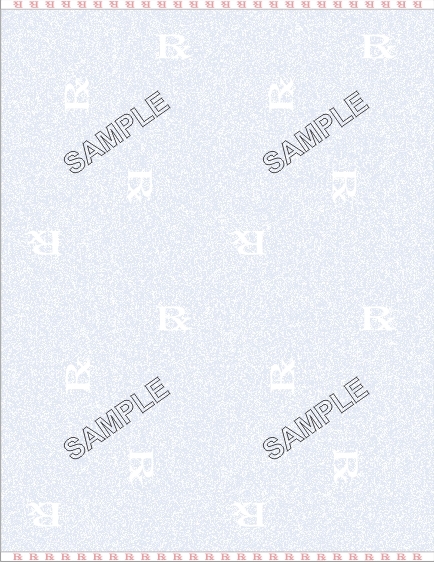 as part of the artificial watermark. Rub a coin over the back of the sheet to activate this feature. A Production "Batch Number" is printed on every sheet of Secure Guard Prescription Pad Paper. A Document Security Feature Warning Box appears on the back of the sheet. "Check Out for Laser Prescription Paper, Roll Prescription Paper and Medical Statement Paper (No Imprint Information Required)"
fill in the requested information under your order. Finally click on "Submit Secure Order"
We appreciate your order. Your order will ship with 2 to 3 business days. Please allow extra time for transit by UPS.